With premium BAQUACIL® pool care products, you can finally achieve the kind of clarity your pool was designed for in the first place. After all, BAQUACIL® brand does away with tedious pool care by enabling you to convert your pool into a chlorine-free, carefree sanctuary in less than 24 hours. The result? Clear, beautiful water that’s gentle on eyes, hair and skin, not to mention pool surfaces and swimsuits. How effective is BAQUACIL® Swimming Pool Sanitizer and Algistat? BAQUACIL’s® chemical structure makes it extremely stable and is not affected by sunlight, temperature or pH fluctuations. BAQUACIL® brand offers the CDX® system, a pool care system that features a 3-step, three product chlorine-free routine that is easy to use. The real advantage behind BAQUACIL® brand is the peace of mind all of our products offer thanks to the brand’s dependable, consistent bacteria control. And less time worrying about bacteria means more time to enjoy fun in the water with your family. Count on BAQUACIL® brand for long-lasting effectiveness against bacteria with the chemistry found in BAQUACIL® Swimming Pool Sanitizer and Algistat. Better still, it’s more stable than chlorine, so it won’t burn off in the summer heat and sun. And that means your pool maintains consistent bacteria protection day after day… true pool care bliss! 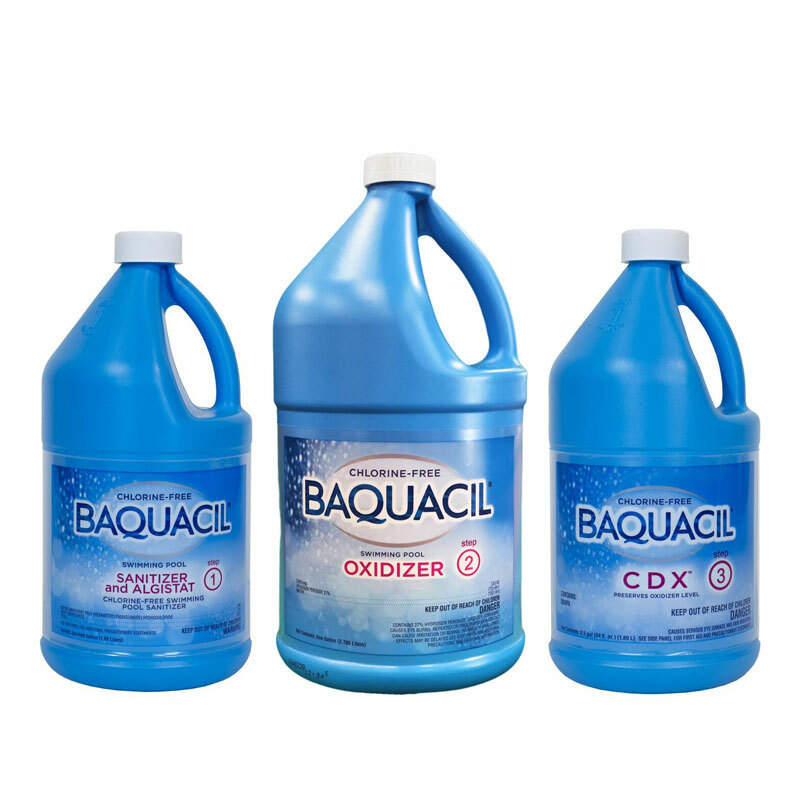 BAQUACIL® brand offers consistent, long-lasting protection. With just one application, bacteria levels are controlled for as long as 10-14 days.